It may be because you love your neighborhood. Maybe your house has the most wonderful view, or it's walking distance from work. Or maybe you just don't want to deal with the hassle of selling your house and buying a new one. Whatever the reason, you're not going anywhere. But you do need more room. And now you're wondering how to add on to your home, so you can stay put and still spread out a bit more. It's a popular choice these days, so finding the right contractor and sorting through the paperwork should be easier than even a few years ago. Here's a quick list of the things you need to keep in mind before you start, and once the addition is in progress. Before you even consider approaching a contractor or an architect, get a clear picture of your budget for this home addition project. And remember, few home improvement projects come in at or under budget, so make sure you're prepared for the worst. Different states, cities and counties have different rules about residential renovations, so make sure you're clear on what's allowed according to zoning regulations, what permits need to be pulled, and who is allowed to do the work. For instance, your city may require a licensed electrician to do all the new wiring, while another city might allow you to do the wiring as long as an electrician inspects the work. If you're considering adding on to your home, you'll probably have to check with your HOA, development board or other neighborhood authority. Get a copy of their rules in writing, and make sure any exceptions or variances they grant are in writing as well. If you're not sure about what's allowed and what's not, you might want to talk to a real estate attorney before you start work. If you want to go up, make sure you get a consult from a structural engineer to ensure that your foundation and first floor can support raising the roof. If you choose to go down, a structural engineer and a geologist need to make sure the house will remain secure and the ground underneath can be safely excavated. An architect will be able to draw up plans to combine your existing home with the addition. They will also take into account the reports from the structural engineer and geologist as well as the zoning and HOA rules. This may seem like an unnecessary expense when addition plans are available online. But using generic house plans can turn your expensive addition into an eyesore, a code violation or even a safety hazard. Forget the flashy ads in magazines and on TV. And by all means do not hire your best friend, co-worker or brother-in law. Do your homework and find a reliable contractor. Check the Better Business Bureau, ask neighbors who have had work done, and read user-generated reviews on things like Angie's List. Before you sign, do look at examples of their work around town. If a contractor won't let you see projects they've completed, run don't walk! Then find another contractor! Hiring a real estate or general practice attorney for a couple of hours to draft or review your contract is money well spent. The contractor is working for themselves...you need to make sure your end is covered too. Make sure you know what's being done, and when, Make sure all permits are current, and are displayed properly. And make sure you're present when inspections are done. It's your house and your addition, and you deserve to know what's right and wrong. 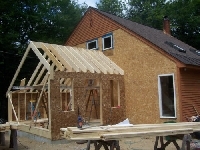 Every home addition is different. But if you know the basic steps, the whole process of how to add on to your home will seem a lot less mysterious and stressful.